I used to try to avoid buying packaged foods as much as possible because I wanted to stop throwing single use plastic in the bin! This was made much easier by shopping in places like farm shops, local shops and online companies. I’ve learned a lot about shopping without packaging and if I go to the right places I can get most of my food unpackaged or with limited packaging. Going out of my way to avoid packaged foods is great, but it isn’t a solution to the problems of packaging. For most people the desire to avoid plastic packaged foods is not top priority and it shouldn’t have to be. There is more to making a decision about food than just the packaging it comes in. For some people affordability has to be their main concern. For some the quality or variety of the food will be the most important thing and for others who don’t have much spare time they just need to get their food in the quickest and easiest way. There are also times when regardless of your priorities, what you need at the time you need it is only available with packaging. Currently prioritising zero waste isn’t always the best or most practical solution in our every day lives. There is less choice in unpackaged produce. Usually the unpackaged fruit and veg is larger in size, is not organic and is limited in variety. For example in one supermarket you can buy loose white button mushrooms. Chestnut mushrooms, portobello mushrooms or organic mushrooms only come packaged though. You can also buy loose apples there, but they are quite big. If I give my kids a large apple they will leave half of it because they can’t get through it, which is a waste. I would prefer to give them a smaller apple, but the small apples only come in bulk bags. It feels like people are sometimes penalised for buying unpackaged foods in the supermarkets. Does packaging reduce food waste? Supermarkets that I have spoken to about the problems of packaged food tell me that the packaging helps reduce food waste. They are right it does at their end. Packaging is usually specially designed to suit the produce. Some packets are airtight and contain gases that slow the produce from visually spoiling. Other packets have specific ventilation in the packet to allow the produce to breathe. Packaging can also protect products from getting squashed. The problem is that the work to reduce food waste at the supermarket end of things, is often counter productive. The packet itself encourages people to buy more than they need. This is because it seems like a better deal, rather than buying exactly what they want. Then when they don’t get round to using it all in time, it ends up in the bin. In the UK a shocking 70% of post farm gate food waste comes from households. Food waste is also costing the average family £60 a month (taken from a WRAP report / Love Food Hate Waste). On top of the food waste, there is also a large amount of packaging waste. I believe that supermarkets need to be accountable for the food waste that they are contributing to in people’s homes. Not just the food waste occurring at their end of things. What can we do about this problem? What are your suggestions? I think things need to change – don’t you? It’s an hard balance isn’t It? There is also the waste you don’t see to consider, farmers grow roughly 30% more than they need to, to meet the needs of the supermarket, but this often ends up as waste. I am aiming to be a zero-waster but I think the name itself is awful, and sets us up to fail. I think it leads people to dismiss the small acts they do achieve and feel like they are failing, and really it’s the small acts by the many that will make the biggest difference. In an ideal world we would buy everything package free, but like you say travelling an extra 30 minutes to buy unpackaged apples defeats the object as you say! In some cases packaging is a nessisary evil, in order to keep food fresh and avoid more waste, but any answer we can find to make that packaging more sustainable is a good! Totally agree. 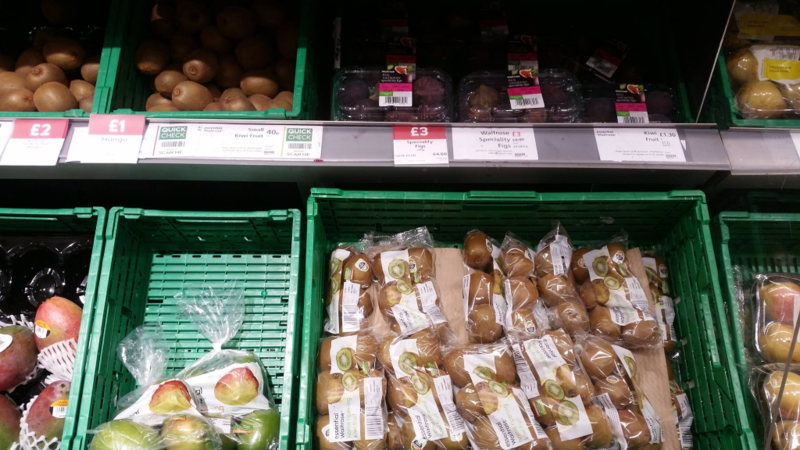 We need a change and supermarkets are responsible for the packaging they produce and the problems with customer’s over buying and so creating food waste. Hi Hannah, you are right zero waste is too hard and small acts can make a big difference. I think we can only do the best we can do in any given circumstances when it comes to packaging. I want the supermarkets to make unpackaged goods more accessible though to all, by making them affordable and in the same amount of variety as the packaged goods where possible. That would be brilliant, and if done correctly could help reduce food waste for families. We used to get stuck in the trap of buying a pack just for 1 item, and then the others spoiling, we are much better now but I imagine lots of families are the same.